What is ONECARD Kids+ E-Wallet? If you are a ONECARD member, your children may apply for ONECARD Kids+ for FREE! Now kids can be part of the ONECARD family too! ONECARD Kids+ is an added free privilege for valid ONECARD members’ children who are 12 years old and below. The validity of ONECARD Kids+ will follow the corresponding parent’s ONECARD expiry date. Valid ONECARD Kids+ enjoy FREE auto transition to ONECARD when they turn 13 years old. Member can collect his / her ONECARD at any Customer Service Centres or Concierge at 1 Utama. With all the same functions and benefits as a ONECARD member except for parking privileges, kids can now join in the fun by earning and redeeming UPoints and most importantly, enjoying extra privileges and treats specially catered for them! Reminder: ONECARD Kids+ does not have a Parking function, therefore cannot be used for parking. Get an exclusive FREE Gift when you sign up for ONECARD Kids+ now! Earn and Redeem UPoints at any ONECARD Participating Outlets. Discover great promotions or instant discounts at selected outlets especially for ONECARD Kids+ from time to time. Enjoy The Club @ Bukit Utama sports and golf facilities via UPoints Redemption on weekdays only. Be the first to know when there are fun and exciting children activities and limited edition goodies! It's a cool new way for kids to receive pocket money and shop at any ONECARD participating outlet! Top up UPoints to your ONECARD Kids+ as pocket money for your children’s e-Wallet. Parents can not only allocate their kids’ pocket money easily buy also track and monitor your kid's spending without hassle. Log in to your account here. Shop cashless at any ONECARD participating outlet by paying for purchase with your ONECARD Kids+ e-Wallet. Lost your ONECARD Kids+ e-Wallet? No worries! You are still protected by your personal login password, which is needed for every redemption transaction of purchase made with your ONECARD Kids+ e-Wallet. Forgot your login password? Simply reset it here. The minimum UPoints reload is RM10. You may reload UPoints into your ONECARD Kids+ via cash or credit card at any of our Customer Service Centre or Concierge, 1 Utama Shopping Centre. What is Lil’ Star Saver? 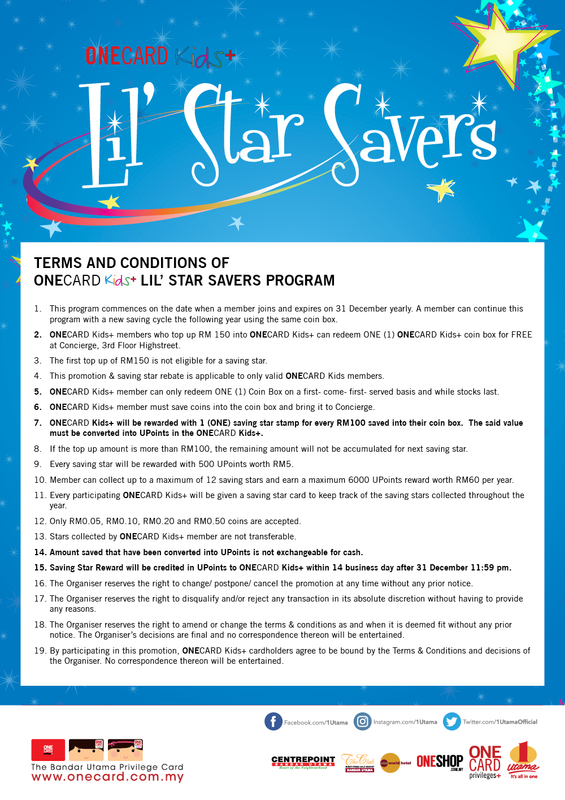 It’s a new program for ONECARD Kids+ to encourage juniors to save and enjoy rebate from us! Top up your ONECARD Kids+ with min RM150 to get a FREE Mini Bus Coin Box at Concierge 3rd Floor, Highstreet. Save coins up to RM100 in the coin box and bring it over to Concierge 3rd Floor, Highstreet. You will be given a saving star for every RM100 coins collected. Each saving star is entitled to RM5 UPoints*. Collect up to a maximum of 12 saving stars and enjoy your reward at the end of the year. View other T&Cs apply here. Join our ONECARD Kids+ Family now! Parents / guardians may proceed to our Concierge, 3rd Floor Highstreet or any of our Customer Service Centres, Ground Floor Highstreet or 2nd Floor Centre Court to apply for ONECARD Kids+ Card. Your card will be processed and given to your kids upon sign up for FREE. A complimentary sign-up gift can also be collected on the spot. Check out more on Terms & Conditions.